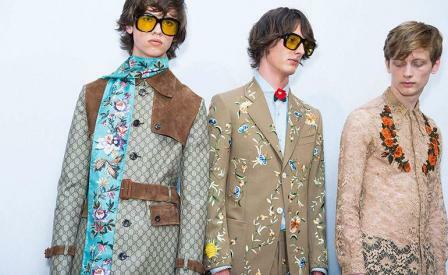 Mood board: Girls who are girls, who like boys to be girls seems to be one of the new missives at Gucci. And the most shocking thing about this is how brilliantly it all works. The Italian brand's new creative director Alessandro Michele is tapping into something magical, floating around fashion’s fickle air. Not only do his feminine men and their gender-flexible fashion feel so right, but so too do the romantic layers of handcraft filigree he pours over these impeccably made clothes. Best in show: There were countless showstoppers in this intriguing show, from the yolk-shaped collared shirts to the richly patchworked laces and crochetted jogging outfits. But our favourite was the gold, brocade-covered velour track suit that looked as opulent as a kimono. Finishing touches: Not sure how many men will swap a tie for a printed bow around their neck? No worries. Gucci’s tills are sure to keep ringing with the ropes of bracelets, gypsy rings, feathered necklaces, lace fluff collars and oversized sunglasses that were frosted over every look. Also spotted: the new 'It' black bootie of the season.